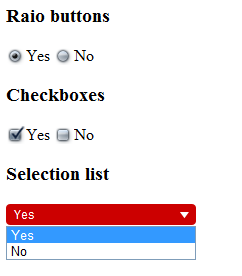 I want to style the form elements such as radio button, checkbox or selection list. Google shows me a very good tutorial written by Ryan Fait. In the above tutorial, those form elements will be replaced by a span element. It works great. Only 1 minor problem which is those span elements could not align well. So i made some change on the CSS. Here is my example. In order to have your own radio button and checkbox, you can create the radio.png/checkbox.png with fixed height for each buttons states. In this example, the radio.png/checkbox.png has 100px height which means the button height should be 25px. If you have large button size, change the following values in the custom-form-elements.js. Pingback: Drupal 7 – Styling checkbox and radio button in Webform | Eureka!